Network Rail has chosen an additional alternative railway route to the storm-stricken Dawlish line along the Devon coast, BBC News can reveal. The route would head from Okehampton to Plymouth via Tavistock and go through parts of Dartmoor National Park. However, Network Rail said abandoning the Dawlish route was "not an option". Three alternatives to that route have been discussed locally over the years. This looks like a candid and deliberate disclosure from a senior Network Rail figure. Just a month ago, it would have been news that Network Rail felt any sort of secondary inland rail route was desirable. Now, they are not only saying that it is, they are saying which one is their frontrunner. What they are finally discussing openly is a railway equivalent of the A303 - a slow, back-up route to use when the motorway has problems. The A303 goes through the Blackdown Hills - a designated area of outstanding natural beauty. This railway line would go through part of Dartmoor National Park. It is going to be an interesting debate. Reaction on social media so far has been muted from Dartmoor whereas there is distinct wariness from south Devon. Of the three alternatives, two of them are in south Devon - including the Teign Valley route, via Christow and Heathfield - and the so-called Dawlish Avoiding Line, which was promoted in the 1930s but was never built. Network Rail is believed to be only considering the Okehampton-Tavistock-Plymouth route. Trains can already run to Meldon, west of Okehampton, on a freight line and there are currently plans to reopen a stretch of line connecting Tavistock southwards to Bere Alston. 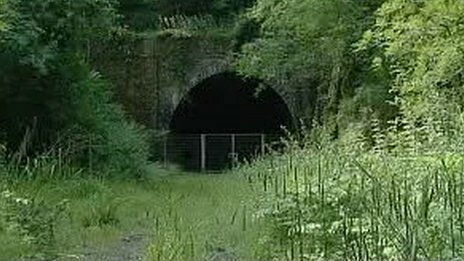 The route between Meldon and Tavistock is being considered by Network Rail. Patrick Hallgate, of Network Rail, said: "It's hundreds of millions of pounds to do, and it's on land that has already been built on in terms of the old railway alignment. "It's also on land that we don't currently own. So, there are all sorts of long-term strategies that would be required to make that happen." Bill Hitchins, chairman of Dartmoor National Park Authority, said: "We have not seen any kind of proposal to discuss, much less vote on. "I'm sure we would be only too pleased to be involved in any discussions. "Personally, I have always felt that it (the line) should not have been closed, and it should not have been developed in the way it has been developed." Damage to the track at Dawlish means the line between Exeter St Davids and Newton Abbot is not expected to reopen until mid-April at the earliest, and in the meantime buses are replacing trains. However, despite talk of alternatives, Network Rail said it was committed to a permanent restoration of the Dawlish track. It said any other routes would be in addition to the existing line, not least because about £10m had been on improvements at Dawlish over recent years. Julian Burnell, from Network Rail, said: "Some people have said, 'Why don't we abandon this line?'. That's not an option. "This is a main line, it's a scenic line and it serves some very important towns along south Devon on the way down to Plymouth. "We're not going to abandon this line." Prime Minister David Cameron pledged to have rail services running through Dawlish "as soon as possible", acknowledging the situation was a "very real problem", during a visit to the county. He said a study would be carried out into the resilience of rail services in the south-west. He also visited Dorset and Kingsand in Cornwall to see storm damage. Elsewhere on the line, flooding in the Bridgwater and Taunton areas in Somerset meant a limited number of trains were able to run between the towns. CrossCountry have buses replacing trains non-stop between Bristol Parkway and Plymouth. Passengers requiring interim stops can travel on First Great Western buses. Trains between Exeter St Davids and Waterloo are now able to run normally following a landslip near Crewkerne. The Exeter-to-London Paddington line has reopened after earlier flooding at Castle Cary.